Last May, the horse Justify won the Triple Crown of horse racing. It is a spectacular feat for a horse to win three demanding races in five weeks. The announcers were all over themselves about the accomplishment. "Justify has just made history!!!!" Sure, he made history by becoming just one of the few horses to ever win the Triple Crown. But wouldn't he have also made history if he had failed and joined the many others that have lost the last race after winning the first two? Wouldn't he have also made history if he had also lost the second race and won the other two? Or if he had lost any combination of the three? What if he had never raced at all? Everything that happens is history. It only becomes important when it is written down, read by others and compared to other events that have happened. History is the telling of events. Sure, some are much more important than others and is then written down in many volumes for all to read. Many events happen and then are quickly forgotten. Those events only become important when someone researches those events and writes them down for others to read and discover. Some events do not become important until someone makes a big effort to make a mark in history, like chasing the home run record. Other events do not become important until the event comes around, like the Olympic Games. And far as the past condemning those that cannot repeat it - well I can think of plenty of things in my past that I would love to have repeated! Therefore, I take on the task of condensing some of the history of our Bob Jenkins Coaches Classic Cross Country Championships. It is important, I think, that everyone learns to appreciate the efforts that have gone into making this the largest cross country meet in the state. Those of us that are old enough to have been around at the first ones and can still remember the things that were never written down and would not be discovered by the novice just looking at the results owe to all to let them know the important dates and individuals, both athletes and coaches, that have made the Classic the CLASSIC. Reading the results of the meets is like reading the results from the State Championships. Most of the individual winners and teams champions have become our State Champs. The meet has had at least 44,742 runners cross the finish line and 5,151 teams have received a team score (I say at least because I do not have the results for the girls in 1984 and 1985 or the boys for 1984.) The meet has always been held the week after the Eye Opener except in 2003 when it was held two weeks after the Opener (anyone know why?). The first set of results I have are from 1983. The meet was initially called the Carolina Classic and was held at a park across from Irmo Middle School. The late Mike Moore of Irmo was the meet director. Nine girls' teams and 13 boys' teams scored in this event with a total of 61 girls and 88 boys completed the course. It is important to understand that this was a large race in 1983! Times were recorded on what we called a tick sheet. This sheet had columns of numbers from :00 to :59. As the timer, you wrote the minute at the top of the column and then put a check mark beside the seconds when a runner crossed the finish line. You did this for every runner. If multiple runners came across at the same time you put a check for each runner. As the runner progressed through the finish chute, he/she was given a tongue depressor or an index card with a number on it that represented the place of finish. After the race each coach would turn in his place cards with the name and school of the athlete that received that card and someone from the host school would write that name and school in the appropriate spot on the score sheet. The scorekeeper would then go back and write the time for that place on the score sheet that corresponded with the place from the timing tick sheet. 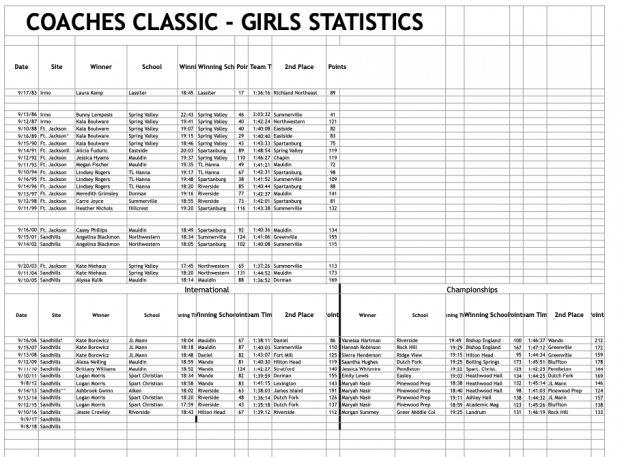 Team scores were then tabulated. The scorekeeper would go through the individuals one at a time, write the finish places for each runner under a column for the school. The scorekeeper would then add the top five runners from each school to get the team score. If a team did not finish five runners and the scorekeeper did not know this until he/she reached the end of the list he/she would have to start over and skip the team that didn't finish five runners. This was all very tedious and could get very frustrating, especially as a meet got larger and larger. In 1985, I asked Mike for the chance to score the meet using a computer program written by one of my students. Of course he agreed. The entries were mailed to me (yes, all entries were handwritten by the coach onto an entry form and mailed to the meet director so that it was received a few days before the meet!). We typed the names into the system, assigned numbers to all of the runners and successfully scored the four races using Apple IIe computers. Until the 2012 meet, Eastside was responsible for collecting entries and scoring all of the races of the Carolina and Coaches Classic. More on collecting entries later. In 1988, Coach Moore decided that the meet was too large for the Irmo area and moved the meet to Hilton Field at Fort Jackson. Hilton Field is a huge open area that has a few hundred yards of asphalt that looks like a small runway. This is used as the area where the soldiers parade for graduation, etc. Behind the asphalt is a section of covered seating for a couple hundred guests. On the roof of the stands is a small enclosed area where we set up the computers. We had to bring our own ladder to get up to that area but it put us out of the way from the noise of the coaches wanting to know the score. Scoring was still tedious. We had to type each bib number and then the times for each athlete. But the program printed out complete results and team scores. I also need to point out that numbers in those days did not have tear off strips on the bottom of each number. While preparing for the races, we had to staple a perforated card on the bottom of the number so that we could collect them in order after each runner crossed the finish line. Coach Moore decided that he did not want to do the meet anymore in 1989. Because the South Carolina Track and Cross Country Coaches Association saw an important value of having an open meet on the course that would host the State Championships they decided to take the meet. John Jones at Spring Valley agreed to take care of the course setup parking, etc., Eastside would continue to do the entries and scoring and the SCTCCCA would handle the finances, awards and other officials necessary to run the meet. The meet was still called the Carolina Classic for 1989 and 1990. In 1991 the meet name was changed to the Coaches Classic to mirror our track meet in the spring. Competing at Fort Jackson offered us as meet directors (the SCTCCCA, Coach Jones and myself) a new set of obstacles unlike any other site for a meet in the state. Since Fort Jackson is a U.S. military base we were required to have release forms signed by each athlete/parent. When a coach submitted his entries he was required to send one form per athlete that was signed by the athlete and parents. There was also another team release form that all of the athletes and coaches were to sign and submit. When a packet arrived, I had to cross reference each entry to make sure that the entrant had an individual release form and had signed the other one. If the form(s) was not present the athlete was not entered. I then had to file all of these forms so that I could do the same thing for all of the enter teams at the State Championships. These years also established records on both the boys and girls side that have not been broken. Marc Davis of Spartanburg won the 1989, 1990 and 1991 meets making him the only three time male winner. Darren Cline of Hillcrest (94,95), David Adams of Hilton Head (98,99), Steve Boyd of Summerville (01,02), and Luke Lovelace of Chapin (06,07) are the only two time winners in the same division. Kala Boulware of Spring Valley won in 1987, 1988, 1989 and 1990. Joining her recently as four time winners are Maryah Nasir of Pinewood Prep (12, 13, 14, 15) in the Championship Division and Logan Morris of Spartanburg Christian who won four times in five years (11, 12, 14, 15). Lindsey Rogers of T.L. Hanna (94, 95, 96) and Kate Borowicz of J.L. Mann (06, 07, 08) are the only same division three time winners. The meet continued to grow as most schools wanted their teams to have the opportunity to run on the State Championship course. 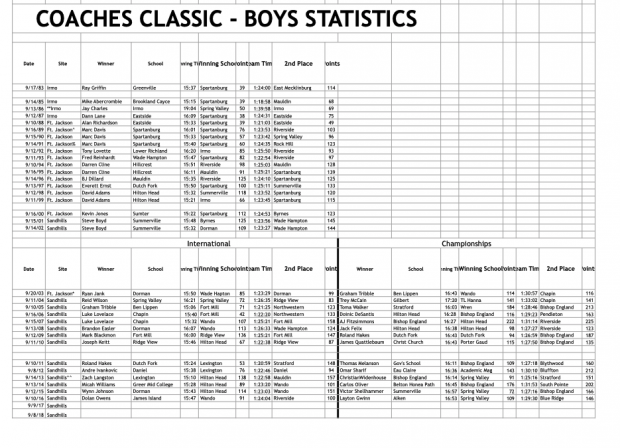 In 2000 the number of athletes in the boys JV division had reached a size (429 finishers in 1999) where we could no longer collect the data in the finish chutes for such a large number. To decrease the number we split the JV by grade offering a 7-9 division and a 10-12 division. We did the same thing for the girls in 2000. Tuesday morning on September 11, 2001 just a few days before the Classic was to take place, terrorists attacked our country by destroying the Twin Towers in New York City and crashing a plane into the Pentagon in Washington. Another attach was thwarted by the passengers in the plane that was crashed in Pennsylvania. Thousand of Americans were killed. Needless to say, Fort Jackson, as were all military and other security bases were under high alert and under no circumstances would the Classic be held at Hilton Field. There was a lot of talk about cancelling the meet, but many felt that a return to normalcy was important. John Jones secured the Clemson Sandhills Research Park, made out a course and had it ready for our use in a matter of days. The 2001 version of the Classic was the first of many major meets held at the Sandhills facility. Fort Jackson allowed us to return two years later but under even more strict guidelines. In the days before student ID's were required by schools, Ft. Jackson required every person entering the base to have an ID. At Eastside, as was done at all of the schools around the state, we grabbed our digital cameras and made picture ID's of all of our athletes that did not have a drivers license or a pictured permit. Upon entering the fort, soldiers would come on the bus and check each ID. They would also quickly search the bus, look in storage areas and under the bus. Not only buses were checked but every car that entered was appropriately searched including the trunks. You can image the backup this caused for the 100s of buses and other vehicles that came to compete or watch the races. After the 2003 races, we decided that Sandhills would become our permanent home. By 2003 the boys' varsity races were getting too large. We decided to allow more runners per school to decrease some of the JV numbers and combine the JV back into one race and change the varsity races into two divisions called the International and Championship. The International Division is supposed to have the schools who think their team is a top 10 team in their classification even though no school is required to participate in a particular division. By 2006 we did the same for the girls' races. The meet continued to grow so that by 2011 we added back the two divisions for the JV boys' races. In 2002, a parent of one of my runners wrote an online entry program so that every school in the state could stop mailing entries to the Classic and many other meets in the state. The online entry also allowed us to download all of a teams' entries straight into the new Hy-Tek scoring system. This eliminated a lot of typing and helped us get ready for a meet much faster. In 2012, Eastside stopped doing the scoring because of the new technology of "chip timing." Chip timing is an RFID device given to each runner, either tied to the shoe or is attached to the back of the number, which gives off a particular frequency for each athlete. The frequency is received by electronic devices when the athlete crosses the finish line. This eliminates the necessity of collecting the finish tags as well as timing each athlete. The results are almost instantaneous and extremely accurate. In the spring of 2013 the track and cross country coaches of South Carolina were saddened by the death of Bob Jenkins. Bob was a hall-of-fame coach and had won the National Coach of the Year in both track and cross country. He was the coach at Rock Hill, Northwestern, and South Pointe. Bob was a founding member of the SCTCCCA and worked hard to promote the sport and our athletes. He was the meet director for the Trojan Relays in March and hosted many qualifying track and cross country meets during his many years at Northwestern. Bob was a big proponent of S.C. having an indoor T&F season. A mentor to all of the coaches of the state and a huge voice for our sports was lost. To honor him, the SCTCCCA decided to name the two meets that it sponsors by naming them the Bob Jenkins Cross Country Coaches Classic and the Bob Jenkins Track and Field Coaches Classic. The 2013 edition of the cross country meet was the first so named. The 2017 Coaches Classic was cancelled on the Thursday before the meet because of the preparation, evacuation and flooding caused by Hurricane Irma. Today the SCTCCCA is still in charge of the meet. The meet has grown from a total of 22 teams (13 boys, 9 girls) and 237 athletes (including JV, 163 boys and 74 girls) to the totals in 2016 of 84 varsity boy teams, 80 varsity girls teams and 2,571 athletes crossing the finish line (1,129 girls and 1,442 boys). Coach Jones has retired from Spring Valley and taken another coaching at Waccamaw High. Matt Oberly has taken over at Spring Valley and has very graciously agreed to continue the long SV tradition of setting up and managing the facility at Sandhills. This is a thankless job. Not only does it take an entire day to set up but it takes all day Saturday after the meet and some on Sunday to clear the course and clean up the trash from the 2,000 or more athletes and spectators that watch the Classic. At each of the sites the course was changed for one reason or another. I remember one year at Ft. Jackson we had to take an alternate route because the fort had put up soccer fields where we had previously run. And in 2016 a row of planted trees changed the course at Sandhills. I also have recollections of the hill at Sandhills being part of the course twice. So, please be kind when comparing winning times and team times between the years. It is very obvious that the 1986 meet had a very long course with the winning girls at 22:43 and the winning boy at 19:04. The reasons of the changes, how they, along with the weather affected the times, is long lost. Many schools will be adding to the history of the Classic this weekend but only a few will walk away with awards. They will be the ones hoping to add to or begin streaks that will be added to the ones already established. The Spring Valley girls have the record for consecutive wins (5, 1986-1990, 92). Riverside (96-98, 13-15) is tied for the most wins. Wando (09-12) and Pinewood Prep (12-15) are the only other schools with more than three consecutive wins with four. The Spartanburg boys have the records for the most consecutive wins with five (1987-1991) and the most total wins with nine (85, 87-91, 93, 97, 2000). The lowest score for the boys is 38 by Spartanburg in 1987; for girls it is 29 by Spring Valley in 1989 (Lassiter from Georgia scored 17 in 1983 but we do not allow out of state schools now). The meet record on the current course for the boys is 15:06 by Graham Tribble of Ben Lippen in 2015 followed by a 15:10 by Zack Langston of Lexington in 2013. For the girls, Logan Morris of Spartanburg Christian has the meet best at Sandhills with a 17:59 followed closely by an 18:02 (Ashbrook Gwinn of Aiken), 18:04 (Kate Borowicz of J.L. Mann) and an 18:05 (Angelina Blackmon of Northwestern). And a lesson from the history. The 1996 boys' team score between Riverside and Spartanburg is a tie - 125 points for each. In high school cross country a tie is broken by the placement of the team's sixth runner - the first sixth place runner in wins the meet for the tied teams. Riverside's sixth was just one overall place better (2 seconds difference) than Spartanburg's and Spartanburg's seventh place was just behind their sixth place. Just remember that in cross country place is the most important thing! Attached (bottom of article) are all of the varsity meet winners I could find beginning in 1983. If it is blank, I don't know the information. I also listed the first and second place teams and their points as well as the total (top five) time for the winning team. Cross country can be loaded with stats just like other sports. Maybe someday I or someone else will add to the rich history of this meet. I cannot remember all of the past (this is my best effort for this meet) but there are many instances I would love to repeat it. History is rich and becomes important when you make it important. Use this to motivate and to appreciate all that has happened in the past. Best of luck this weekend as each of you make your own history at the Classic. Winston Churchill said "History will be kind to me for I intend to write it." I wrote this one and I alone am responsible for any errors. I would appreciate any corrections or additions as long as they can be substantiated. I would also appreciate all of the older coaches to dig into your files and your memories to help add to this account. Does anyone have the results of 1984 and 1985? Was the first meet in 1983 or are there prior results? Thanks for reading and if I can get enough positive responses, I'll do another for the Mike Moore Lake Murray Invitational meet next week. The views expressed in this article are solely those of the author. It is the hope that these thoughts, though maybe controversial, will open dialog between coaches, athletes, meet directors, and the S.C. High School League to find insightful and meaningful ideas to promote improvements in the sports of track and cross country. Click here to read more columns by Boehmke.